We are an Ascension people. The Lectionary gives me a hard choice for my reflections this Sunday. 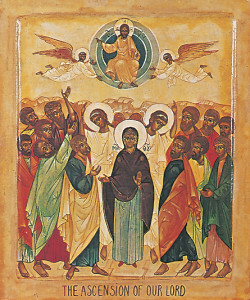 Ascension is supposed to be on Thursday, the fortieth day from Easter. Where I live, the liturgy celebrated it then, but in most of the US it is transferred to Sunday. So my Sunday reflections could be on Ascension, or on the Sunday after Ascension. I’m going to write about the Sunday after Ascension, because that is the time in which we live: after the Ascension. In the Liturgy, we are between Ascension and Pentecost. The first reading gives us nothing but the apostles going to pray while they wait for Pentecost. Of course, we live after Pentecost – but this is our time too, the time after Ascension, of praying for the Holy Spirit. They go back to the Upper Room to pray, to the room of the Last Supper. That is what we do at the Mass: we live in the time after the Ascension, praying for the Holy Spirit to come on us and make us the Church. And they pray with Mary, and that’s what we do with Mary. Mary doesn’t teach us activism, she just teaches us how to pray, to long for Christ and beg for the Holy Spirit. We are in the time after the Ascension. Our reading from John’s Gospel finally takes the turn to Jesus’s final prayer. John 13 is the washing of the feet. John 14-16 is the farewell discourse, all the final things Jesus says to his disciples. But John 17 is his prayer to the Father. Both the discourse (14-16) and the prayer (17) mingle the Cross with the Ascension. Our reading this Sunday, for example, ends, “And now I will no longer be in the world, but they are in the world, while I am coming to you.” He is leaving through the Cross, and he will leave through the Ascension. Cross-Ascension are one Paschal mystery. It is the mystery of our time, the time after the Ascension. The Gospel takes us through several related ideas. “Give glory to your son, so that your son may glorify you.” We are able to know the Father, to appreciate his glory, because he shares that glory with us. We can see him only to the extent that he gives us a share in his divine nature. When the glory of God dwells in us, we can see God in his glory, and show that glory to others. “This is eternal life, that they should know you.” Eternal life isn’t “after” this life. Eternal life is knowing God. Eternal life is contemplative, it is nothing other than knowing and loving the goodness and the glory of God. It is “after” this life inasmuch as we cannot yet see him. But it begins now, in every taste we get of his glory. “I revealed your name. . . . And they have kept your word. . . . The words you gave to me I have given to them.” The Christian mystery is the mystery of Revelation. God shares himself with us. He tells us, of course, lots about how we should live – but ultimately what he shares is his “name”: knowledge of himself, divine intimacy. And that knowledge is mediated through words. Words are mysterious things. Of course the letters on the paper are nothing; the strange sounds coming from our mouth are nothing; and our ideas are far short of God. Yet somehow, the mystery of Scripture is the mystery of a God who tells us about himself. Somehow, through these words, we catch a glimpse. The glory he gives us is the deeper part of our knowing him: the grace, and light, of faith. But faith comes alive through meditation on his words. “I do not pray for the world but for the ones you have given me, because they are yours.” The words sound harsh. But the point is grace. The point is that we have been given an amazing gift. Sometimes we get carried away by talking about how everyone is a child of God. Of course there is an important sense in which that is true. But never forget how privileged we are to have been called beyond the world, given a share in the glory of Christ, given knowledge of his name through faith in his words. That’s not a put-down to other people. It’s an amazing gift to us. What does it mean to be an Ascension people? It means to seek the things that are above, to be called to a glory beyond this world. In what ways do you find yourself settling for less than the glory of the Ascended Christ? Around this time of year you sometimes hear priests saying we are an “Easter People” or even a “Resurrection People.” But what does it mean? As far as I can tell, “Easter” is an old-English word that means little more than “Spring Festival.” But what is our Spring Festival? Other Catholic languages use the Hebrew word Pasch, which at least ties “Easter” to the Passover and to the whole “Paschal mystery” of Christ’s death and resurrection. Still, what is the meaning of Easter? And what is the meaning of the Resurrection? 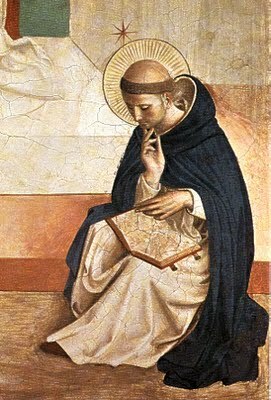 Perhaps I’m jaded: when I was in college, a priest used to use the non sequitur argument that we shouldn’t kneel before the Eucharist because we are a “Resurrection People.” But the same “liberal” logic passes over to some “conservative” Catholics, where Chesterton’s famous comments about “beef and beer” sometimes seem to devolve into a kind of Catholic pseudo-orthodoxy that thinks the Incarnation means we should all make ourselves at home in the world, eat drink and be merry. Is that what Resurrection means? “The battle’s done,” we’re an Easter people, let’s be fat and happy and self-referential? I was struck in my reading this year by a Thomist theologian who tied the Resurrection to the Ascension. The Bible is a little confusing here. Of course we know that Jesus was “seen by them through forty days” (Acts 1:3), apparently before the Ascension (1:6-9). And Thomas Aquinas seems confident to say the Ascension was “after forty days” (IIIa q. 55, a. 3, arg. 2; ibid. a. 5; ibid. q. 57, a. 1, arg. 4). But the only other place the Bible talks about the Ascension is at the end of Luke’s Gospel – same author as Acts – where the drumbeat is “that same day” (Luke 24:13), “the same hour” (24:33), “as they were speaking” (24:36), and then, apparently with no passage of time, “He led them out as far as Bethany . 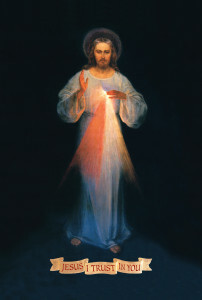 . . and as he blessed them, He withdrew from them and was carried up into Heaven” (24:50). Now, I’m not trying to throw you into confusion about when we should celebrate the Ascension. I’m just trying to say the Ascension and the Resurrection are not so far apart. They are more like two parts of the same mystery. We tend to think, perhaps, that the Resurrection is the big deal, and then later on something obscure detail gets added on – and so our “Resurrection people” focuses on a God who is sitting on the beach having a meal. But you wouldn’t be out of line if you instead thought that Jesus ascended on Easter Day, but made appearances “through forty days” so that they would understand the truth of the Ascension. You wouldn’t be out of line if you thought of the Ascension as the main mystery, and the Resurrection and its appearances as sort of a step on the way. The anamnesis, the important but over-looked prayer right after the Consecration of the Eucharist, ties the two together. Eucharistic Prayer II, the shortest and so the most often used, just says “his Death and Resurrection,” but (google them if you’re interested) in EP III and the ancient EP I, the Roman Canon, the grammar gets strange as the two are tangled into one mystery. The Ascension is not an afterthought. These prayers summarize a lot of what we have been reading from the Farewell Discourse of John’s Gospel. The mystery of the Ascension is that our humanity is taken to heaven. Yes, in the Resurrection our humanity conquers death. But Jesus has a better plan than that: he wants us to share with him in the life of heaven. We are an Ascension People. The Resurrection does not mean that we make ourselves at home on earth. It means that we are destined for heavenly glory. Nor does the Resurrection mean that we are afraid to kneel: it means we are still on our way, trembling, to something eye has not seen and ear has not heard. We are an Easter People. But the Paschal Mystery, our Springtime celebration, doesn’t just mean we won and now we can party. On one side of the Resurrection is the Cross, through which we must pass continually until we reach the glory of heaven. And on the other side of the Resurrection is the Ascension, which calls us not to get too comfortable here on earth, but to long for heavenly things, the heavenly places that Jesus has prepared for us. What does the Ascension mean for you? Our Gospel continues on from last Sunday’s reading in John 14. John expands on little details from the other Gospels. They tell us about the institution of the Eucharist. 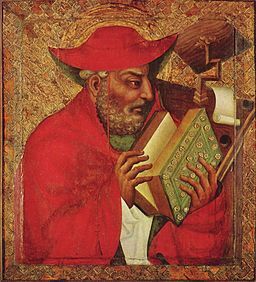 He takes us deep into the meaning of the Eucharist, not only in John 6, where he gives Jesus’s preaching about the multiplication of loaves and the Bread of Life, but also in John 13, where Jesus washes the disciples’ feet, and then 14-17, where he preaches at length about his love for his disciples, the Church. Our Gospel this Sunday has two themes: the commandment and the Spirit. Now, the other Gospels, especially in the Sermon on the Mount, emphasize how love establishes the old commandments: if you love, you won’t kill or commit adultery or lie, etc., in fact you’ll never come close to those things. John knows this point has been made – but he wants to emphasize the other direction, the necessity of love. Our reading this Sunday begins and ends with Jesus saying that if you love him, you will keep his commandments. In the next chapter he will say, “if you keep my commandments, you abide in my love,” just as he keeps his Father’s commandments and abides in his Father’s love. “Abide” is one of John’s favorite words: we dwell in that love, live there, take time there, remain there. But in that chapter after ours, right after he says “if you keep my commandments,” he says, “this is my commandment: love as I have loved you.” He has said the same thing in the chapter before ours: “a new commandment I give you: as I have loved you, love one another.” He has just washed their feet. The Tradition calls Holy Thursday “Maundy” Thursday because of the commandment, the mandatum, to wash each other’s feet and love one another. Jesus tells us to keep his commandments, in the plural – but Jesus really only gives one commandment: love as I have loved you. St. Thérèse points out the newness of this commandment. The Old Testament told us to love our neighbor as we love ourselves. That’s pretty hard. But Jesus gives a new commandment: love not as we love ourselves, but as he loves ourselves, which is vastly more. That is his commandment. And that is the whole thing, that love is Christianity. The other theme in our reading for this Sunday is the Holy Spirit. 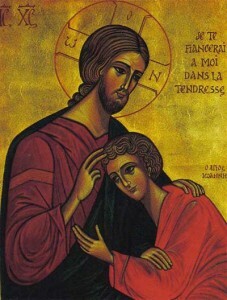 Jesus emphasizes that the world does not have the Spirit, does not see him or know him or accept him. But we do know him because – here’s that word again – the Spirit dwells in us, abides with us. In John’s Prologue, he says we are born as children of God not by blood (not just because we are human), not by the will of the flesh or even the will of man, but from God. Here he makes the same point in a different way: love is not just automatically in “the world.” Love is the presence of the Spirit in us. We can love as Jesus loves not because we try real hard – not by “the will of man” – and certainly not because it’s just human nature, but because he pours his Spirit, his love, into our hearts. This is why the sacraments are an essential part of Christianity: because they are the means, the instruments, by which Christ pours his Spirit, his love, into our hearts. Only his Spirit allows us to love as he loves. Our reading this week from Acts continues the story of the deacons. Stephen has been stoned, now there are a few stories about the deacon Philip. The deacons have been ordained to free up the Apostles for preaching – but the deacons too, Luke tells us, are “full of the Holy Spirit,” and they too proclaim the Gospel, by word and deed. And they go forth to bring the Spirit to others: they baptize, and then call the Apostles – the givers of the sacraments – to give the fullness of the Spirit by laying on hands. Our reading from First Peter is about apologetics – it uses that Greek word. But it is not quite the apologetics we sometimes learn. 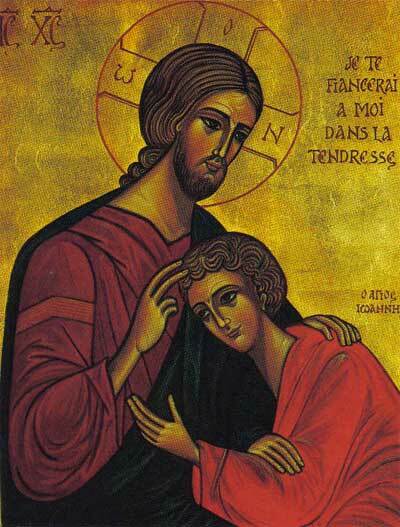 Peter calls us to give a reason (a logos) not for our faith, but for our hope. Tell them of your hope in Christ! And the whole reading makes clear that the context matters. Our “apologetic” begins with sanctifying the Lord in our hearts and ends with meekness, with fear – our translation says “reverence,” but Peter is saying, be ever so careful – and with a readiness to lay down our lives in gentleness, as Christ did, suffering not because we are obnoxious but only for the good we have done. Our apologetics is love. How does dwelling in Christ’s love – or not – affect your witness to the faith? Throughout the Easter season we read the Acts of the Apostles. 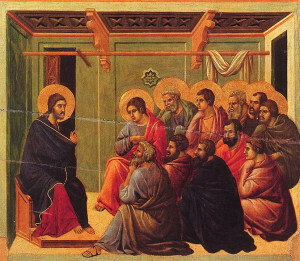 Up till now it has been Peter’s preaching at Pentecost. In the weeks to come it will be the spreading of the Gospel to the nations. 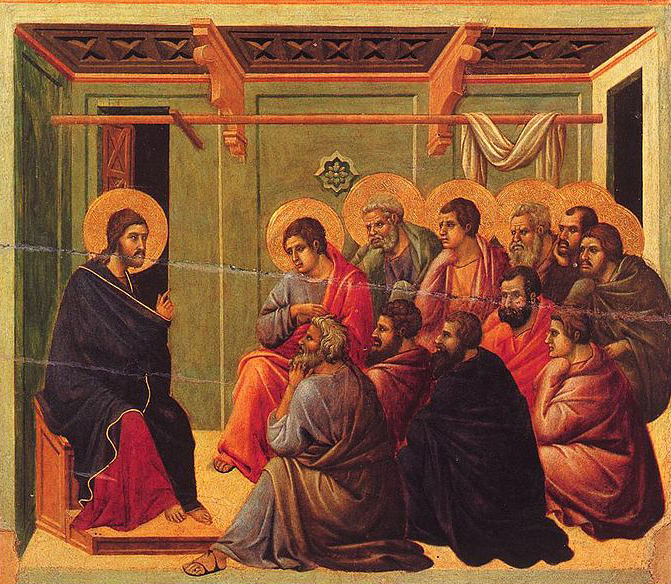 But this week we get the central theme of Acts: the repetition of Christ’s life in the life of the Apostles. Christianity, need I say, is Christ-centered. A curious phenomenon of the Catholic Right is a constant assertion that we should be “reverent” and focus on the “transcendent,” which, they frequently assert, “all religions do” – while, meanwhile, you hear precious little reference to what is distinct about Christianity. What is distinct about Christianity is Christ, and the repetition of his life in the life of his Body, the Church. Instead of “reverent, transcendent liturgy,” let’s have a life and liturgy centered on Christ. That also means Biblical liturgy, where we hear the unique message of Jesus Christ. As usual, John overwhelms us. But we can pull some of these strains together. First, there is location. People say many pagan things about transcendence and immanence, but in the Eucharist, in the other sacraments, and in Scripture, as in the Incarnation, we have a God who draws us to himself. It is not sufficient to say God is transcendent, and it is even less sufficient to say he is immanent. The point is that by his grace, we ascend to the place from which he descended. God became man so that man could be united with God: anything less is not Christianity. The reason Scripture is important is because it tells us something absolutely new about God. Jesus, who alone is with the Father, has told us about something we could never have imagined. Without belief in his words, trust in what he tells us, we can never know the amazing truth of the Gospel. We need to hear his voice. That means not just sitting in silence, where we hear our own internal voices, but reading Scripture, the voice of Christ, the Word of God, which speaks from outside of us and tells us something absolutely new. The third theme is works. “Believe me . . . or else believe because of the works.” “Whoever believes in me will do the works that I do.” Faith bears fruit. If we receive his Word, we learn what it means to receive Him; if we receive Him we are transformed to dwell where He is. which is “a holy priesthood to offer spiritual sacrifices”: through the ministry of the Apostles and priests, all of us are called to be priestly, in liturgy and life. But to be that priestly house, we must be built on Jesus Christ, whom we know, Peter says, through “faith.” Those who “disobey the word” – literally, those who do not assent to the word – see Christ only as a stumbling block. Only through faith in Christ and his words can we become the holy people we are called to be. How do you let your mind be transformed by the truth of the Gospel? The fourth Sunday of Easter is the Good Shepherd. Each year on this Sunday we read different sections of John 10, turning from accounts of the Resurrection in the first three Sundays to Jesus’s preaching at the Last Supper (John 14-17) in the weeks to come, and so penetrating into the meaning of Easter. John’s Gospel is an overwhelmingly rich commentary on the other Gospels. In Matthew 13, the disciples ask Jesus why he speaks in parables; he responds with the parable of the Sower: his word is good seed, but it needs to be received in good earth. John 10 is a variation on the same theme. He then launches into the parable of the Good Shepherd, through all of chapter 10. Jesus’s preaching is punctuated with the responses of the Pharisees. Our reading includes the first response, “They did not understand what it was which He spoke to them.” Later in the chapter they debate whether “he has a devil, and is mad.” Later still they want to stone him. Just as the good seed takes root only in good soil, so the sheep only follow their shepherd. And as the seed in Matthew’s Gospel is the word, what the sheep follow in John’s Gospel is the voice of the Shepherd. But in John’s version, the sheep have a bit more intelligence. They do not just passively receive the word, they hear it, recognize it, and follow it. This week’s installment from First Peter ends with a line about sheep. It may be a play on words. The Greek for sheep literally means, “the ones who walk straight forward.” Maybe that is part of what people mean when they say sheep are stupid: they just plod straight ahead. Peter gives two images of sheep. First, “You had gone astray like sheep”: they just keep wandering off in whatever direction. But second, “You have now returned” – the Greek word is turn – “to the shepherd.” They plod straight ahead – unless they hear the voice of their shepherd and guardian, in which case they turn to follow. Not so stupid, as long as they have a good shepherd and they know his voice. Jesus mixes his metaphors. He is the shepherd; he is also the gatekeeper and the gate. We could summarize the mixed metaphor as Jesus, Jesus, Jesus, through him, with him, in him, Christ before me, Christ beside me, Christ behind me. He warns us that there are those who would enter the sheepfold by other ways. Jesus the Good Shepherd wants life for his sheep, wants to lead us to pasture, but the others are thieves who want to slaughter the sheep. Beware all that is not Jesus. Beware Catholicisms of the Right and the Left that have something to offer you other than the love of Jesus. This week’s reading from Acts is the end of Peter’s sermon at Pentecost, completing the reading from last week. Our translation happens to botch the key word: “Save yourself,” it has, in the last line, “from this corrupt generation.” But the point is precisely that we cannot save ourselves. The Greek says, “be saved” – by Jesus. In response to Peter’s preaching, his audience has asked, “What are we to do.” Peter says, “Repent and be baptized.” Repent, because the one “that God has made both Lord and Christ,” is the Jesus “whom you have crucified.” We have gone astray. Repent, because this world is crooked and corrupt. Peter offers one more metaphor. “Christ suffered for you, leaving you an example, that you should follow in his footsteps.” The word for “follow” is the one used several times in John 10. Go where he leads. The “leave you an example” is a bit abstract in the English. In the Greek, the image is of something written in bold so that you can put tracing paper over it. “Copy” his example, follow his voice, no matter where it leads. How could you better get to know the voice of the Shepherd?